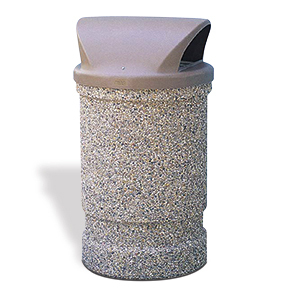 Keep landscapes looking smart for the community with waste receptacles that encourage litter responsibility and help maintaining clean spaces. Concrete is a popular choice of many installations for its natural look and material longevity. A modern two-way opening dome lid securely connects the lid to base while keeping contents out of sight and prevents the collection of precipitation in the liner. The lid is constructed from durable polyethylene and will not rust, stain, dent, chip or fade ready for high volume use. Security cable comes standard, liner is optional and sold separately. ASTM compliant standard and premium finishes available to suit landscape designs. Suit any design theme with the available standard and premium finishes.